The end of summer in Iqaluit is almost here…and chances are, your car or truck probably got a little dirty this season. But don’t fret! 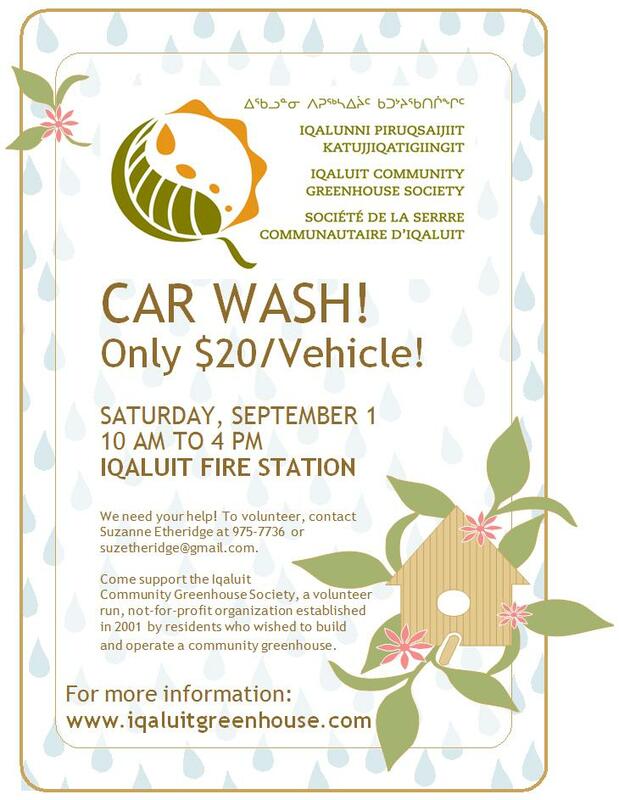 The Iqaluit Community Greenhouse Society will be holding a car wash fundraiser on Saturday, September 1 from 10 AM to 4 PM at the Iqaluit Fire Station. This fundraiser will be weather permitting, so watch for an announcement by 9 AM on Saturday if the weather looks iffy. For only $20, we will get your car sparkling and shiny in preparation for winter. This is the last long weekend of the season – take advantage of it (and us!) to get some pre-winter cleaning done! Don’t have a vehicle, but still want to help? We would love for you to come and wash cars with us! Contact Suzanne Etheridge to confirm your attendance.